Herm Sprenger Company presents extra links of 1/11 inch (2.25 mm) in diameter for this Stainless Steel Pinch Collar. It is great money saving. Now you don't have to buy a new dog collar if your pet put on weight or grew up. 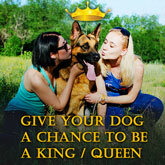 This offer will be appreciated by those people who are on strict budget and can't afford a new pinch collar. These extra links snap in easily for extra length. It is very easy to add new links - no special skills or tools are required. An additional link that will add 1 1/5 inch (3 cm) to the total collar length. 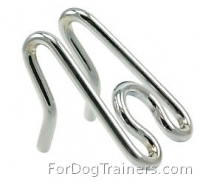 These links are made of High Quality Stainless Steel. No more rusty surface on the links. Choose what is the best and safe for your pet! Stainless steel is, above all, a very practical material, however, this material is both aesthetically beautiful and noble.